A combination of gold and green tea compounds may be potential treatment for prostate cancer, according to researchers from the University of Missouri. In a new mouse study published in the Proceedings of the National Academy of Sciences, the researchers found that a combination of a compound found in green tea leaves and radioactive gold nanoparticles were able to destroy the tumour cells. The tea compound, which was attracted to the cancerous cells, helped to deliver the gold nanoparticles, which killed the cancer cells. Researchers said large doses of chemotherapy, which sometimes have toxic side effects, are currently used to treat a variety of cancers, but the new treatment would require doses that are "thousands of times" lower than that of chemotherapy. The particles are small enough to destroy the diseased cells, but leave the healthy surrounding tissue and cells intact. "By combining a natural component in green tea that has an affinity for prostate tumour cells, we have formed gold nanoparticles that have a high uptake in tumour cells," ABC News quoted Dr. Cathy Cutler, research professor at the MU Research Reactor and co-author of the study, as saying. "This formulation of gold nanoparticles, which has shown such tumour cell death at such a low dose in a model of aggressive human prostate cancer indicates it could be effective for aggressive prostate cancer," Dr. Cutler noted. 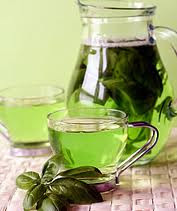 The green tea compound used in the study, known as epigallocatechin-gallate, or EGCg, is an antioxidant that has been shown in prior research to have cancer-fighting properties. Dr. David Crawford, professor of surgery and radiation oncology at the University of Colorado Health Sciences Center, said the use of nanoparticles for a number of areas in medicine to deliver therapy is "exciting," and, while early in development, still promising. But Dr. Derek Raghavan, president of Levine Cancer Institute at Carolinas HealthCare System, called the study "headline hunting" and noted the gap between data and clinical application is "vast." He said there are years of research needed to ensure the safety and efficacy of the treatment. Nevertheless, the University of Missouri scientists were optimistic in their findings, and said they plan on following up their research in dogs, which they said get a form of the disease very similar to the human form.